Women shield themselves from the sun with umbrellas in Tokyo on July 24, 2018. Less than two weeks after torrential rains wreaked destruction across Japan, the country is facing yet another weather-related crisis: a record-breaking heat wave that forecasters say could last until early August. More than 30,000 people have been admitted to the hospital for heatstroke, and at least 77 deaths have been registered in the past two weeks, including a 6-year-old boy in Aichi prefecture who died July 17 after a school excursion, Kyodo News reported. [post_ads]Government agencies have warned that the country's 35 million senior citizens are particularly vulnerable to the heat; at least 80 percent of the deaths have been among those age 65 and above, a researcher told Reuters. 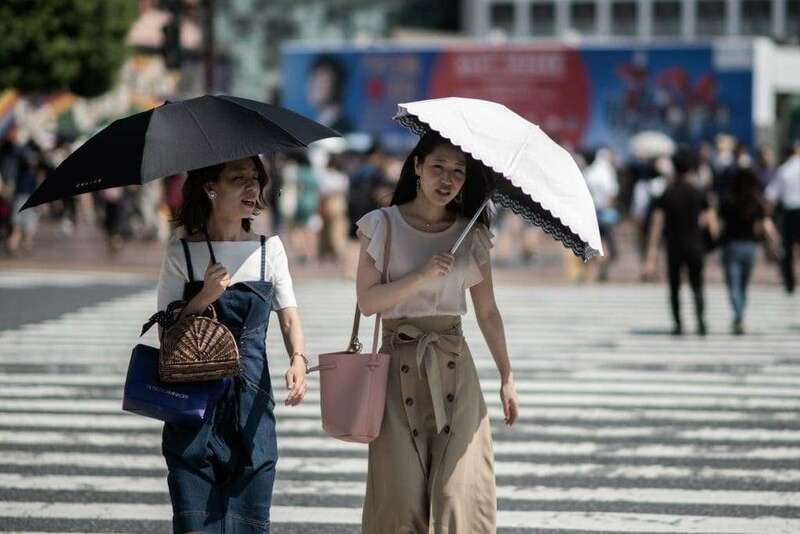 A spokesman for the agency told the BBC that many areas of the country have experienced “unprecedented levels of heat.” In the city of Kumagaya, 40 miles from Tokyo, temperatures rose to 106 degrees Fahrenheit (about 41 degrees Celsius) on Monday — the highest recorded in Japan. In Tokyo, home to more than 9 million people, temperatures topping 104 degrees were reported for the first time. In the past week, schools across Japan have canceled outdoor and sporting events, CNN reported, including parts of the famous Gion Matsuri festival that runs in Kyoto each July. Air conditioning is relatively rare in Japan, where years of government-led environmental campaigns have encouraged residents and organizations to reduce their reliance on cooling technology. According to CNN, a 2017 government survey found fewer than 45 percent of state-run elementary and middle schools had air conditioning and most apartment buildings did not have centralized climate-control systems. To cool off, many people in Tokyo have started bringing small fans with them as they walk through the streets. Other heat-combating devices were put on display on Thursday at a trade fair in the city, including industrial-strength mist sprayers and a jacket with built-in fans. Japan's heat wave has also renewed concerns about the country's ability to host the next Summer Olympics, which are scheduled for July and August 2020. Earlier this month, a representative of the International Olympic Committee said steps were being taken to minimize the impact of Japan's summer heat on the Games, the Wall Street Journal reported. Announcements have already been made that some outdoor events, such as the marathon, will be held at earlier hours than usual to avoid the heat.